The Internet of Things (IoT) is generating a sea of valuable data that promises to unveil hidden meaning beyond the limits of human thinking. While an exciting prospect, what if systems were designed to augment our own intelligence – helping us make smarter decisions? Enter the era of the Cognitive IoT, where machines can analyze the remaining 80% of data left untouched by today’s systems and learn from their interactions with both the data and people. The next generation of cognitive startups will get insights quicker, scale bigger, be more competitive and really, truly change the world. 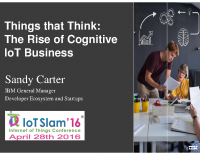 In this talk, IBM General Manager Sandy Carter will show you three ways that companies are embedding cognitive IoT into their companies to acquire new customers, grow their ecosystems, and create one-of-a-kind customer experiences. Sandy Carter is General Manager Developer Ecosystem and Startups, responsible for IBM’s worldwide focus on the Cloud ecosystem for Developers, Startups and Accelerators. As the chief evangelist for the ecosystem, she helps developers increase their productivity and creativity. The author of 3 books, including “Get Bold,” Sandy is a recognized expert: Cloud Top 5 Influencers, B2B News Network’s 2015 B2B Influencer, C-Suite Social Media Legend, Top 10 Cloud Influencer, Forbes Global Top 40 Social Marketing Masters, Top Growth Hackers, Top 10 in Social Media, Top 50 Social Business Influencers,10 Most Powerful Women in Tech, Women of M2M for Internet of Things (IoT), and CNN Women of the Channel. Sandy was recently named CRN 2016 Channel Chief. Sandy is on the board of Girls in Tech, WITI (Women in Technology International), and International Child Art Foundation. She is on the Advisory Board of Women of the Channel (WOTC) West.